All hail black kale. 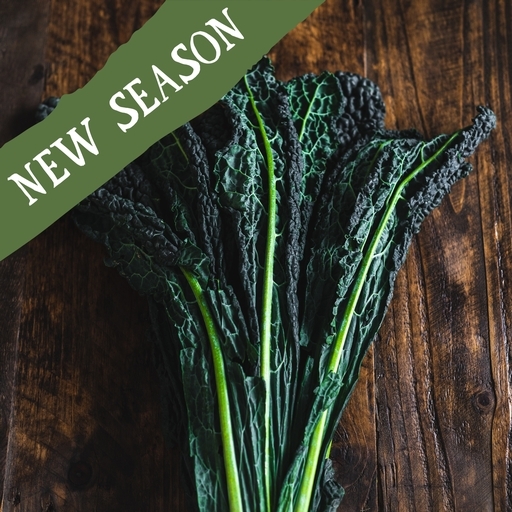 Known more fashionably as cavolo nero (its origins lie in southern Italy), this variety of kale has dark, beautifully blistered leaves and a good robust texture. Black kale is fantastic in peasant soups, ribollita, risotto and pasta dishes. Shred raw and dress with a punchy dressing – yoghurt thinned with olive oil and spiked with garlic and lemon juice works a treat. Or blanch or slow-braise, then lavish with a chunk of butter, a squeeze of lemon and a scrunch of seasoning. Cavolo nero can also be dried in the oven with olive oil and a little salt to make a nutritious, moreish alternative to crisps. Delivered from our farm, so wash before cooking. This will come in a plastic bag in your vegbox and should be stored in your fridge.